NASA’s Johnson Space Center announced that it intends to purchase RFID readers and associated peripherals from A.C.C. 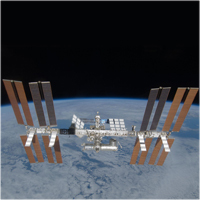 Systems Inc. for a space flight inventory system on the International Space Station. NASA has a requirement for forty-one RFID readers and other associated peripherals— for example extra batteries, handle battery, USB cable and power controller. The RFID readers and peripherals provided by A.C.C. Systems are qualified to support program requirements – shielded such that they passed radiation testing and can accept a total dose of radiation exposure of 600 RAD (with 200 MeV protons. They are also certified for an on-orbit lifetime of 10 years for International Space Station utilization.